Responding to the government’s offer of P1 million for information aiding the capture of renegade Capt. Nicanor Faeldon, the underground Magdalo, composed of active and inactive military officers, has offered its own reward: $100 for any overseas Filipino worker who could tack a ‘kick me out sign’ on Gloria Arroyo’s back during her seven-day visit to Europe. In addition, the OFW would also be entitled to $100 worth of mobile phone credits available for global roaming. The most recent rebel military adventure has drawn mixed reactions in the country and worldwide. Those arrested are still awaiting a decision by the justice department on whether the charges filed by police have probable cause. 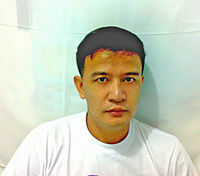 Faeldon has been charged in absentia.